“Jim was very helpful though the entire purchase of the stone look fencing material. Initially I was apprehensive about purchasing my fence material from a company out of country, however after speaking with Jim about the ordering process my concerns were all put to ease. From ensuring I had enough material to mailing samples, Jim was very helpful and patient. I am an owner of a new house. It is my 5th property purchased. I have been looking for the reliable and top quality fences for my properties and your name came across on HGTV. Lori is the first and only person that I spoke to in your firm. She took my hand and guided me step by step though the ordering process. See, watching HGTV does not make me a handyman. Lori even laughed with me at my drawing. She is courteous and professional. She remembers me by my first name at every phone call. She knew exactly what I needed when I was lost at fence jargon. She spoke on A-Fence with pride and joy. All these things made me feel comfortable about dealing with her and your Company. I placed my first order for the newest house that I just closed this Monday. Although I haven’t gotten the fences yet, but I am excited and wanted to tell you about a great job that Lori has done for me. I know now that it is a beginning of my satisfied business transactions and most of all, I gain a friend. Not sure if you remember me. I ordered some deck railing back in September 2010. I told you that there was no real rush in shipping it because I had a very busy schedule and did not know when I would be able to get around to installing it. I finally installed it last month and I could not be happier. I have never had such a great experience ordering something on line. I ordered the wrong posts and your people caught the problem and you advised me of it. Needless to say that saved me a lot of problems and time. From the time I found your web site to the time that it was delivered it was a wonderful experience. I am not sure what carrier delivered it but he came in a large truck and could not get up my long driveway. I was not at home so he and my wife managed to get it up the hill with his pallet jack and a small cart that I have. I want to thank you and every one that had anything to do with my order. I sincerely appreciate all of your help, it certainly is not an easy chore ordering a fence, especially over the phone & internet. You have made the process painless and I am Happy to have found you online. Thank you SO MUCH for answering my barrage of questions, changing my order qty’s 4 or more times, and for handling three different types of fencing in the same job….you were great! If you’d like I will send you pictures when we’re done so you can use them on your website…let me know:) I will be anxiously awaiting the arrival of our fences…Thanks again. I have finished the fence (except the one cap) and I’m very pleased! This has been one of the best engineered products that I have assembled. The directions you emailed were also very good. Overall I was leery of buying this product over the internet but I can say I’m extremely happy with the product start to finish. To you a very sincere “Thank You”! I am so impressed with your product. 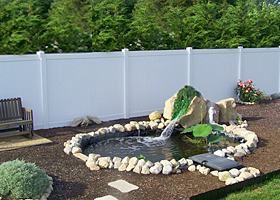 In 1994 we had put in a pool at a former property and used another vinyl Fence Product. I know this looks much better than our last fence. It was less money, easy to install, great instructions and support from the help line. I was skeptical about using the internet for a large purchase. Everything has gone well and I have provided your website to a friend who is looking for ranch fence. You make my life so much easier. You know your stuff. The order looks great with one exception. I hope you can call the factory and change the 54 New England Caps to 54 Seamless Gothic Caps. We only wanted the New England ones where the two 10′ gates are. We will install coach lights at the two driveway gates only. We love the country pickets with gothic caps. I hope this is not a problem. I meant to write you sooner but had to run some errands. My fax machine is still in the box and will need to hook it up to fax your order confirmation in writing. Will do so soon. Getting excited. Have a great weekend. I know I will. I am getting a lot of compliments on my deck and people are asking where I got the material. I’m not totally done with the deck but I should be by the end of this weekend. 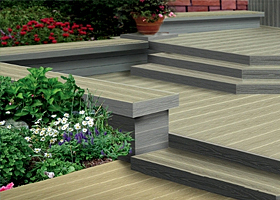 I would like to get some more of your business cards to distribute to people that are interested in this decking. I even gave them samples of your product. I will send you a picture of the deck next week so you can compare it to the original picture I sent to you. Big difference. I just wanted to let you know that I have my new beautiful vinyl fence installed and it looks great. I did have some trouble getting it installed. The first installer didn’t show up and I couldn’t get a hold of him. I was able to get another installer so all is well. My flowers and plants look so nice next to the white. I have noticed your fence all over my city. Now I know why. Thanks again for all your help. The fence arrived on Monday in good shape. My son inventoried the parts today and everything is there. So far this has been a good experience, but yesterday the installer that I had lined up to put it in didn’t show up and I haven’t been able to get a hold of him. Now I’m scrambling to find another. We pulled out the wood fence and have to get the new put up soon. On top of it all, I have been sick this week. Oh well, as my Mom always says, “This too shall pass.” Thanks again for everything. Thanks so much for your help. I received your e-mail confirming my order and with the factory number for tracking purposes. You have really been a big help and we are looking forward to receiving our fence to complete our project. I have your number for future purchases and have referred you to a couple of friends and family members. Thanks again for everything. Just want it to let you know that the fence installation was a success. Ojai in 105 degrees was not the ideal condition (lost 10 pd lol). But the fence looks beautiful, I had fun getting it together. If you are ever in need for a installer in our area keep me in mind. On my part, I certainly will recommend your company whenever a fence project comes up. Its been a pleasure! Fence arrived TODAY! Can you believe it? That’s probably close to a record, right? Looks to be in excellent condition, and all pieces are accounted for, though I will do a breakdown and double check quantities over the weekend. Thanks again, it’s been a pleasure. I received the order today and everything looks fine. One box was damaged but I don’t think anything is missing. Working with you and your company has been a pleasure. Thanks so much. I will recommend you to anyone that mentions buying a fence. Thanks again! I am finally sending you some pictures of my finished project, from last fall. I waited until I could get some good pictures of it when it wasn’t covered in snow, etc. I think it really turned out nice. I’ve had tons of compliments from people I know, as well as people walking/passing by on the street. Thanks for all your help! I appreciate the fact that you went the extra mile for me requesting assistance. I have been extremely happy with your company’s customer service, level of professionalism, and price and would definitely refer you to anyone that I can. As a matter of fact I have already told one of the developers down here about you and he was very surprised at the pricing also. I own a mortgage company down here and have many developers that I work with. You might want to email him to say hi. Thanks again for any assistance. Already have had calls from neighbors complimenting our fence choice (immediate neighbor has an all brick fence & he said our fence made his fence look bad lol) Anyhow, if you need a reference add me. I’m sorry for not getting you these sooner, but my camera was being repaired. As you can see, it turned out great! Thanks for all of your help and support. If you would like to use me as a reference for customers, feel free. Well they just finished installing my privacy fence and it is GORGEOUS!! I just love it, my neighbor’s love it and I am happy. Thank you for all your help and advice. Thank you for your quick service filling the order. The homeowners are very pleased with the look and quality. Well that was fast, we got our order already and everything was in perfect order. We are very happy with this product and your service and will be sure to spread the word that you are the best. The fence is finished. I love it!! Love the pictures of your puppies. They are still on my desk. When I figure out this digital camera, and everything else, will try taking a picture of it for you to see.. Extend my thanks to your boss too! You both made a woman very happy! Since it’s the first vinyl fence in Globe, I’m getting lots of questions, and my referral is to you. I just wanted to tell you my husband should be finishing the fence this weekend. You have a wonderful product. The fence is just beautiful. Thanks for your help making our back yard look wonderful. Thank You for all your help and attention to detail. I will be looking forward to future business with your firm. Thanks for everything. I received shipment on Wednesday, 5/1/02 and all is accounted for, undamaged. I am pleased with the quality of the product, and the service you provided. Now the fun part …. installation! My fence order arrived in St. Martinville, La. in good shape and although I did not check it personally, it seems all there from the info I get from my brother in law. Thank you for your good service. This e-mail is to confirm that we have received your e-mail with our tracking number and freight carrier information. Thank you once again in assisting us with our project. Your professional attitude and prompt correspondence is highly appreciated. We will gladly recommend your company and if the need arises, request your services in the future. I picked up the remainder of my shipment today in Columbus Ga. I will go through the boxes tomorrow and check every thing out . Thanks for your return call to check on things, we enjoyed doing business with you. I received all of your info. Thanks again for your help. You were really wonderful to work with. We are looking forward to receiving and installing everything. We’ll send pictures once it’s all said and done. Thank you for all of your kind help. I had dealt with a couple of other companies online and they were not very considerate. The reason I decided to obtain my fence from you was your kindness and help. I feel I can get the fence installed and have someone to talk with should there be a question. Our privacy fence came out perfect. Thanks for all the great help and service. Buying online is intimidating however your company did everything you said you would and there were no surprises. 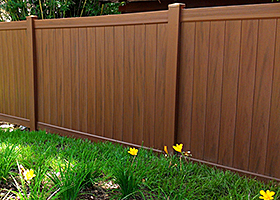 We lover our fence and sincerely appreciate your service. Thanks for all of your help and support with our fence project. Our fence was easy to install and is more beautiful then we imagined. We are very thankful we found your company online. Our horse fence is all installed and came out perfect. We just finished installing the last of it and now can let our horses into our new pasture. Your fence is just as strong as you said. We will need at least one more truckload this spring. Our Simulated Stone Fence is amazing. It was so simple to install, we had our son dig the holes for the posts then my husband had it all up this weekend. I had no idea this was so easy. Our neighbors love it as well they thought it was real rock! Many thanks for making this so easy and cost effective. Thanks for the exceptional service. We submitted a quote, and had a detailed quote in 45 minutes. I was blown away by the service as I was not expecting this. I have worked with many manufactures and have never had such a great experience. Our fence is beautiful and super strong! Does not compare to any other fence I have seen. Thanks again! !